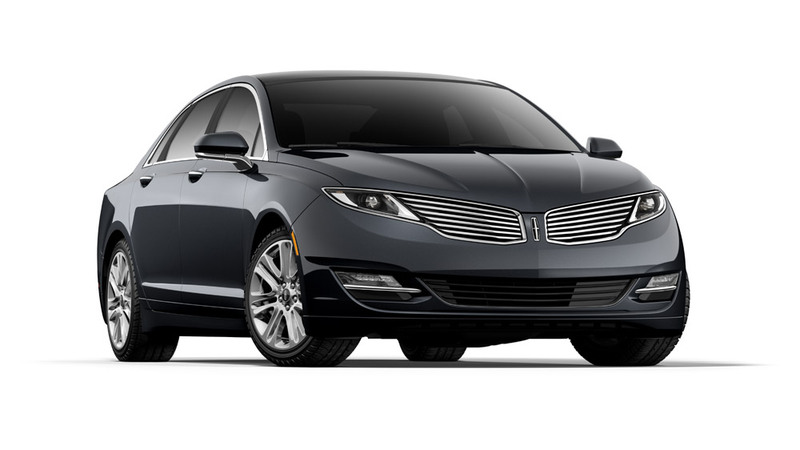 The 2014 Lincoln MKZ is unchanged from its 2013 model year redesign. The 2014 Lincoln MKZ comes in both Standard and Hybrid trim levels. Both the 2014 Lincoln MKZ and MKZ Hybrid boast the same graceful and aerodynamic look as the 2013 model, complete with a split-wing front grille, standard 18” wheels (which can be upgraded to 19” polished aluminum), and a distinctive car-width LED taillight panel. Both the MKZ and MKZ Hybrid come with a number of available color options (e.g. Platinum Dune, Dark Side, Smoked Quartz, and Sterling Gray), and the MKZ Hybrid offers an exclusive Ice Storm paint type. Available exterior upgrades include Daytime Running Lamps, Retractable Panoramic Roof, and Single Panel Moonroof. The 2014 Lincoln MKZ comes with three available engine choices: a 2.0-liter turbocharged four-cylinder base engine, an optional 3.7-liter V6, and the 2.0-liter four-cylinder mated to an electric motor found in the MKZ Hybrid. Front-wheel drive is standard, with all-wheel drive optional on the Standard trim models. The base turbo four-cylinder boasts 240 horsepower and 270 lb-ft of torque, and was tested by Edmunds.com as accelerating from zero to 60 mph in 7.2 seconds (all-wheel drive version). The V6 produces 300 hp, 277 lb-ft of torque, and a 6.7 second zero to 60 time (all-wheel drive version). The MKZ Hybrid creates 188 total horsepower and climbs from zero to 60 in 8.4 seconds (front-wheel drive version). When equipped with the standard 2.0-liter four-cylinder engine, the 2014 Lincoln MKZ achieves an EPA-estimated 22 mpg city/33 mpg highway/26 mpg combined in FWD and 22 mpg city/31 mpg highway/25 mpg combined in AWD; the V6 version of the MKZ touts 19 mpg city/28 mpg highway/22 mpg combined (FWD) and 18 mpg city/26 mpg highway/21 mpg combined (AWD). The MKZ Hybrid gets an impressive 45 miles per gallon in city, highway, and combined driving conditions. Both the Standard and Hybrid MKZ trims offer your choice of Charcoal Black, Light Dune, or Hazelnut leather interior seating (Heated and Heated & Cooled Premium front seats available). The flowing center stack/console with MyFord Touch display makes for easy accessibility, though some would likely prefer the knobs and buttons drivers have come to know and love. A number of interior packages (Aluminum Trim, Brown Swirl Walnut Trim, Technology) enhance the MKZ’s luxury stylings, though a majority of the MKZ’s interior materials are underwhelming in quality. The MKZ Standard offers 15.4 cubic feet of trunk space, while the MKZ Hybrid offers 11.1 cubic feet (reduced slightly by the presence of the battery). The both the MKZ and MKZ Hybrid also suffer from a lack of interior head and leg room, which can make for a stuffy ride. The 2014 Lincoln MKZ and MKZ Hybrid come standard with antilock disc brakes, stability and traction control, and a multitude of airbags. The MyKey system allows for programmable limits on vehicle speed and stereo volume, which comes in handy for those looking to let their teenagers drive. Optional safety equipment includes rearview camera, lane departure warning/lane keeping assist, forward collision warning, blind-spot monitoring system, rear cross-traffic alerts, and airbag-embedded rear seatbelts. The 2014 Lincoln MKZ earned an overall 5-star rating from the National Highway Traffic Safety Administration and is an Insurance Institute for Highway Safety Top Safety Pick Plus. Lincoln of Troy located in Troy, MI is proud to be a premier Lincoln dealership in the Troy, MI area. From the moment you walk into our showroom, you’ll know our commitment to customer service is second to none.